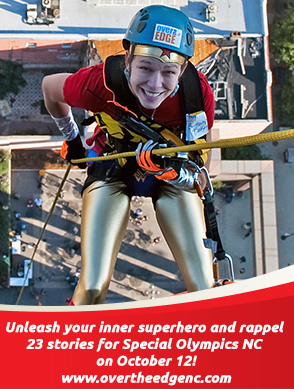 Unleash your inner superhero! Go over the edge for Special Olympics North Carolina and rappel 23 stories down the side of the Fifth Third Center skyscraper on Saturday Oct. 12! This is the coolest trend in fundraising to hit the nation! It’s a safe, fun, adrenaline– filled adventure, and what a city view! Pretend you’re Spiderman or Batman scaling a tower. Live out the experience and even come in costume! Register at overtheedgenc.com. Each rappeller will automatically get a personalized fundraising webpage created so they can begin collecting donations from co-workers, friends and family to meet the $1,000 entry fee for this amazing opportunity. And the best part is all the funds raised go directly to support the sports dreams of children and adults with intellectual disabilities! Special Olympics allows these athletes to have a place where they feel accepted and respected and can experience the joys of competition in 19 different Olympic-type sports. Special Olympics allows them to build their self-esteem, stay physically fit, socialize with friends, and most importantly show off their abilities!